It’s not too late to get tickets for An Afternoon of Jazz at the Modernist Loretta Young Estate or a architectural Bus Tour of Palm Springs neighborhoods where such stars as Dinah Shore and Frank Sinatra and his Rat Pack took refuge from Hollywood or hob nob with VIPs at Palm Springs Modern Committee Annual Gala Benefit at the Lawrence Welk Estate or see designer Christopher Kennedy’s renovation of the Modernism Week Featured Home: La Vie en Rose a 1958 home in posh Vista Las Palmas that backs up to the San Jacinto mountains. You get the gist of this escape. It’s a trip back to mid last century architecture and homes of famous people who wanted to be within a director’s calling distance of LA studios or not too far from Las Vegas stages. A mere 119 miles southeast of Los Angeles and about 230 miles from Las Vegas, Palm Springs, CA sits on the always sunny (more than 350 days) western edge of Coachella Valley in the Colorado Desert. 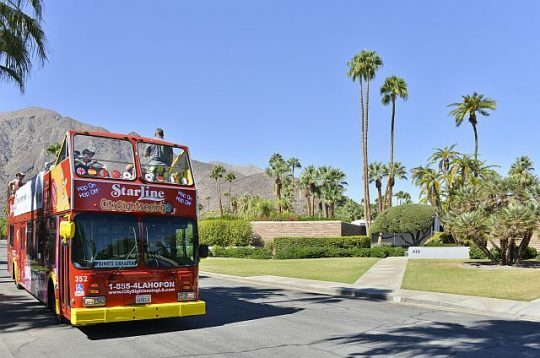 The events just mentions are a few of the dozens of tours and activities taking place in and around Palm Springs during the town’s annual Modernism Week, Feb. 14-24, 2019. The bonus is two, really good shows in the Palm Springs Convention Center. Feb. 15-18, 2019. One is the high-end, Art Palm Springs. The other is a dealers’ Modernism exhibit. Feb. 15-18. The week, actually 10 days, celebrates the area’s reputation for having more mid-last century homes than anywhere else in the world. Here, old homes are not torn down but are instead, preserved for people who appreciate mid-1900s designs. Indeed, the National Trust for Historic Preservation put the area on its America’s Dozen Distinctive Destinations architecture list in 2006. 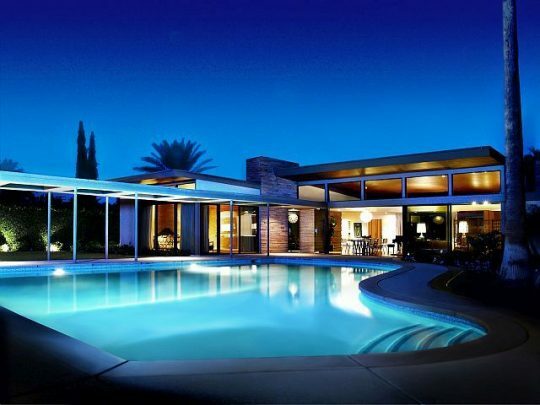 Modernism Week happens twice a year, October and February. The fall event is small but the February one runs out of tickets to some of the popular tours and lectures. Check Tickets to see what is left and snap them up before you go. Definitely get tickets for the Premier Double Decker Architectural Bus Tour. Taking about 2.5 hours, the bus drives around Mid-Century Modern neighborhoods, and past Desert Spanish estates. Knowledgeable guides tell stories about the stars and are likely to explain that the Palm Springs area was chosen because of what was then the studios’ “two-hour rule.” Actors had to be available within a couple of hour’s driving time for film and photo shoot calls..
Mid-century architecture is so valued that the much photographed gas station at the foot of the area’s Tram, is on the tour as a re-purposed Visitors Center. Presidents Dwight Eisenhower and Barack Obama have gotten away from cameras here but it is also a resort and golf area for folks who like its year-round summery weather. At the Modernism Show, wander around the booths of dealers who specialize in 20th century design movements to see furniture and accessories similar to what your parents or grandparents cherished that are now back in style. At the Art Palm Springs show check out the post war and contemporary art works. There is so much to do during Modernism Week, that you should schedule in down-time. Stay awhile to explore the area, shop the boutiques and art galleries. One of the best galleries is Heather James in neighboring Palm Desert. Oh, and get in some golf and spa time. The Greater Palm SpringsVisitors Bureau has lots of ideas.